Embattled Virginia Democrats could survive, but at what cost? WASHINGTON — For Democrats in the past week, the political situation in Virginia has gone from chaos and embarrassment, to a hot mess, to now a full-fledged dumpster fire. 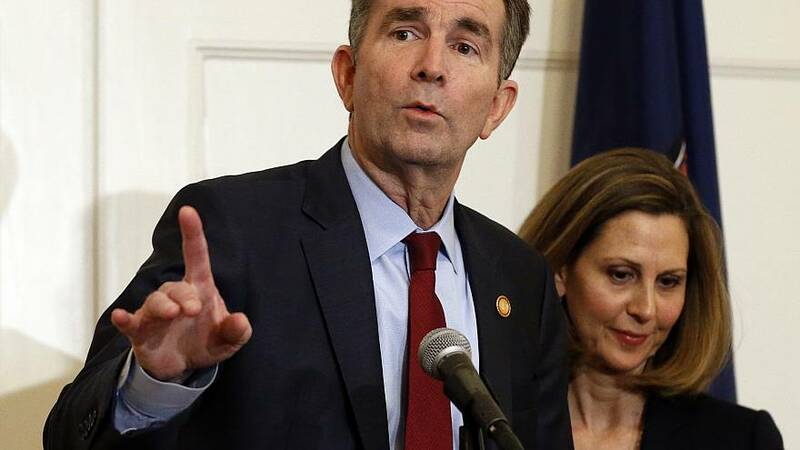 The sitting Democratic governor, Ralph Northam, admitted to wearing blackface in the 1980s (while denying appearing in a racist photo in his medical school yearbook), with Democrats across the country calling for him to resign. A woman has publicly accused the sitting Democratic lieutenant governor, Justin Fairfax, of sexual assault back in 2004. And on Wednesday, the sitting Democratic state Attorney General, Mark Herring, also admitted to wearing blackface in the 1980s. Here's the crazy thing: Because of these back-to-back-to-back revelations, it's possible these Democratic politicians might survive, at least in the short term. Why? If Northam, Fairfax, and Herring all resign at the same time, the next governor of the state would be the current speaker of the Virginia House of Delegates - who is a Republican. Of course, we've seen plenty of scandal-plagued members of Congress survive and even win re-election: Duncan Hunter, R-Calif., Chris Collins, R-N.Y., and Steve King, R-Iowa. But the question becomes how effective a sitting governor, lieutenant governor or attorney general can be with these problems facing them. You can be a zombie back-bench member of Congress and have no one care, at least until the next election. But can you be a zombie governor or state attorney general? That's the situation Virginia Democrats now face. And can the GOP really take advantage in Virginia? But let's not also pretend that today's Republican Party in Virginia can take advantage of this Democratic dumpster fire. Its Senate nominee in 2018 was Corey Stewart; its gubernatorial nominee in 2017 campaigned on keeping Confederate monuments; and the current GOP president is Donald Trump. As the New York Times' Jamelle Bouie observed, "[T]he only thing VA Dems have going for them right now is a) Trump's unpopularity and b) the fact that the VA GOP's last statewide nominee was a straight-up neo-Confederate. hard for them to do a moral contrast!" That woman? Mary Sue Terry, who was elected as state attorney general in 1985 and who won re-election in 1989. Now compare that history with the three Democratic congresswomen who were elected last November - Jennifer Wexton, Abigail Spanberger and Elaine Luria - as well as the women who won House of Delegate races the year before. This morning, in a pair of tweets, President Trump railed against the Democratic investigations into him, claiming that "Republicans never did this to President Obama." With Sen. Amy Klobuchar set to announce her presidential decision on Sunday, HuffPost writes about her long talked-about staffing issues. "At least three people have withdrawn from consideration to lead Sen. Amy Klobuchar's nascent 2020 presidential campaign — and done so in part because of the Minnesota Democrat's history of mistreating her staff… [S]ome former Klobuchar staffers, all of whom spoke to HuffPost on condition of anonymity, describe Klobuchar as habitually demeaning and prone to bursts of cruelty that make it difficult to work in her office for long." More: "Some people who worked for Klobuchar say they valued the experience: Klobuchar has an unrivaled command of details, puts in long, enthusiastic hours, and simply demands that her office meet those same high standards, several former staffers maintained. Those employees described working for her as a challenge, but an exhilarating one." But: "What is indisputable … is that Klobuchar's office consistently has one of the highest rates of staff turnover in the Senate. From 2001 to 2016, she ranked No. 1 in the Senate for staff turnover as measured by LegiStorm, a widely used database of congressional staff salaries. She's now third, behind Maryland Democrat Chris Van Hollen and Louisiana Republican John Kennedy." NBC's Alex Seitz-Wald: "Sen. Elizabeth Warren, D-Mass., publicly apologized Wednesday for any 'harm caused' by her past claims of Native American ancestry, responding once again to a controversy that has dogged her nascent presidential campaign. 'This is about my family, my brothers, and it is about an apology from the heart,' she told reporters outside her office on Capitol Hill." "Warren said she had a "good conversation" last week with the leader of the Cherokee Nation, Principal Chief Bill John Baker, who said in a statement Friday that she had apologized for releasing the results of a DNA test that showed she has distant Native American ancestors. Seitz-Wald adds, "The White House hopeful had hoped to put this issue to rest months before entering the 2020 presidential race, but it was revived this week after the Washington Post uncovered a form she filled out in 1986 to become a member of the Texas Bar Association in which, in her own handwriting, she listed her ethnicity as 'American Indian.'" Former Colorado Gov. John Hickenlooper is in New York for a fundraiser for his Giddy Up PAC, per NBC's Kyle Stewart.